Along the lofty ridges of the Himalayas lies the Kingdom of Bhutan, a place that has remained blissfully untouched by the rest of the world. With very few visitors entering the country, Bhutan’s landscape has remained pristine — its rivers pure and its mountains magical. Bhutan’s people are gracious, the culture is rich, and spirituality is prevalent. And on Boundless Journeys’ Hiking in the Peaceful Kingdom tour, you’ll meet welcoming local people, red-robed lamas, and nomadic yak herders as you learn about the Bhutanese way of life. During this tour, named one of National Geographic Traveler’s "50 Tours of a Lifetime," you’ll hike to remote gold-roofed temples and monasteries and through peaceful villages in emerald valleys surrounded by spectacular Himalayan scenery. Learn about cultural practices, enjoy local culinary delicacies, and take part in an evening of traditional song and dance. Join Boundless Journeys’ active adventure in Bhutan to discover a sacred heritage and distinctive identity that for centuries has remained shrouded by high peaks. Our flight into Bhutan provides spectacular views of the landscape as we approach the airport in the Paro Valley. The valley is a green bowl surrounded by jagged Himalayan mountains and forested hillsides, crossed by beautiful rivers, and dotted with medieval fortresses. The first thing that we notice as we disembark in Bhutan is the absence of noise and a feeling of peacefulness that is rare in most other Asian cities. The Paro Valley has kept its bucolic nature and is one of the most scenic valleys in Bhutan. The houses are considered to be among the most beautiful in the country, and Paro is believed to be one of the first valleys to have received the imprint of Buddhism in Bhutan. We are greeted with a warm Bhutanese reception and then set out on a walk that meanders through the countryside by farms and fields of rice, mustard, buckwheat, eggplant, and, of course, chilies (ubiquitous in Bhutan). Eventually our walk brings us to a road that leads to Kyichu Lhakhang. 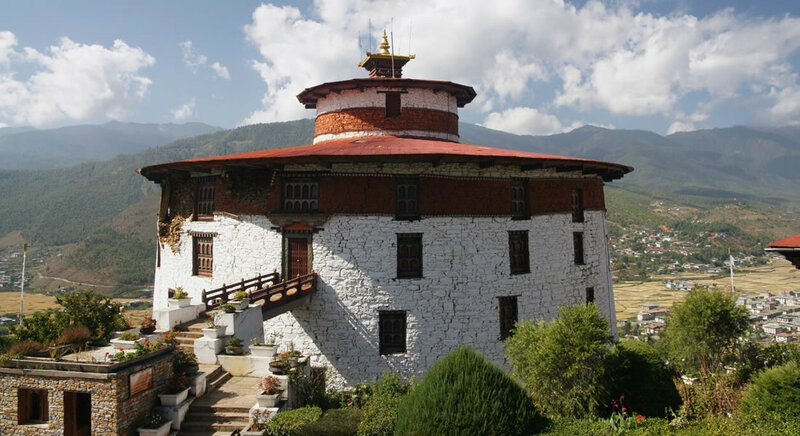 Kyichu Lhakhang, meaning 'twin temples', is believed to have been built in 659 AD by King Songtsen of Tibet, and reflects the introduction of Buddhism to Bhutan. Local legend holds that the temple is one of 108 built throughout the Himalayas in one day in an effort to subdue a mighty ogress; it is still believed to hold her left foot in place. We then make our way by vehicle to the National Museum (closed on government holidays), housed in the round, multi-storied Ta Dzong, built in 1775. The Ta Dzong was once the watchtower for the massive Paro Dzong, built in the 17th century by Shabdrung Ngawang Namgyal. The museum's collection includes ancient artifacts, weapons, a collection of antique thangkha (painted or embroidered religious pictures), textiles, and stamps. We then head (either by foot or vehicle, depending on timing) to the valley's magnificent Rinpung Dzong. Bhutan's dzongs are perhaps the most visibly striking aspect of the kingdom, and these huge citadels dominate the landscape of the major towns and act as the administrative headquarters for their respective regions. If we are fortunate we may have the opportunity to explore within the dzong's mighty walls. However, if the Administrative Body is in session, we must admire from the outside. In the late afternoon we transfer to the capital city of Thimpu. Before becoming Bhutan's official national capital in 1961, Thimphu was simply a rural farming valley. Small and secluded, Thimphu is unlike any other capital in the world. The city is quiet and there are still only a few streets, no traffic lights, and none of the traffic problems that can be common to other Asian cities. We are greeted with a warm Bhutanese reception this evening as we enjoy a welcome dinner together. Hotel Druk is located in the center of the city’s landmarks, near the famous Thimphu clock tower and within walking distance of the main markets. 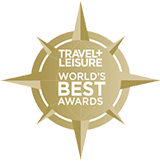 Constructed in traditional Bhutanese style, this distinctive, four-star deluxe hotel is relaxed yet elegant, with all the necessary comforts and amenities. Hotel Druk offers newly refurbished, modern guestrooms with spacious accommodations; a soothing spa; and a stylish bar and restaurant. This morning a short drive through the countryside surrounding Thimphu brings us to the boundary of Jigme Dorji Wildlife Sanctuary, the largest protected area in the country. The park is home to several endangered species, including the takin, snow leopard, blue sheep, tiger, red panda, and the Himalayan black bear. More than 300 species of birds have been catalogued within the park. Our walk begins from the small village of Dodena. The trail starts by crossing a covered bridge over the Wang Chu, and climbs steadily on a switchback trail to Cheri Goemba, a small monastery perched on the hill with a view of the Thimphu Valley. Shabdrung Ngawang Namgyal built this monastery in 1620, and this is where the first community of monks in Bhutan was established. The monastery is considered very sacred, as it contains the ashes of Tempi Nima, the father of the first Shabdrung of Bhutan, and beautiful frescoes of Buddhist saints. After our visit to the monastery, we descend on the same route, keeping our eyes open for the goral (wild goat) that are often spotted on the cliffs nearby. Back at the village of Dodena, we drive to Cabesa, home of the Choki School of Arts (closed on weekends and holidays). 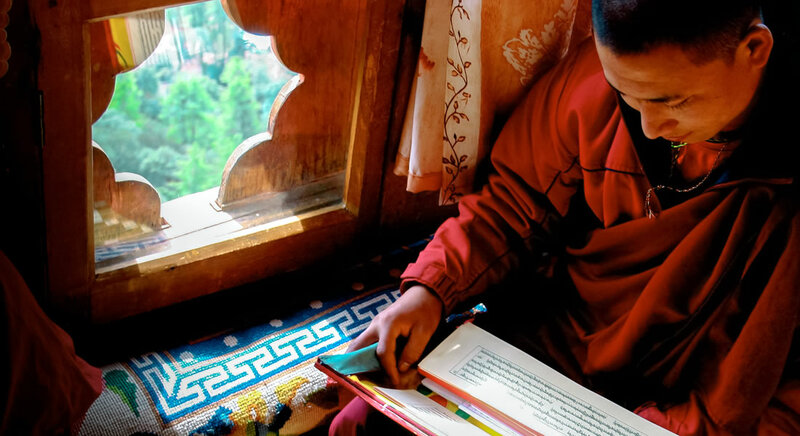 The Choki School is private and provides free, skills-related education in the traditional arts and crafts of Bhutan to Bhutanese children who are unable to complete their formal education. After visiting the school, we return to Thimphu. If time allows this afternoon, we may visit the National Textile Museum, the Thimphu Dzong (seat of the government and main monk body), the School of Traditional Arts and Crafts, the Heritage Museum (museums and schools are closed on weekends and holidays), and the Giant Buddha above town to give us some excellent views of the Thimpu Valley. This evening before dinner, we enjoy a Bhutanese cultural teaching delving into topics that may interest our group. This morning, after an early breakfast, we say goodbye to Thimpu and transfer to the Punakha Valley, our home for the next two nights. The road to Punakha crosses the Dochula Pass (10,230'), offering a great views of the eastern Himalayan Mountains. From the pass, our road descends through magnificent pine and rhododendron forests, and wanders through some of Bhutan's most picturesque countryside. On the road to Punakha we stop in a small village where a short walk brings us to Chime Lhakang, a temple dedicated to the Lama Drukpa Kunley. Drukpa Kunley is one of Bhutan's favorite saints, and is more commonly known as the 'Divine Madman'. He traveled throughout Bhutan and Tibet using songs, humor, and outrageous behavior to dramatize his teachings, believing that the stiffness of the clergy and social conventions were keeping people from learning true Buddhism. This site is still believed to hold fertility powers for women wanting to conceive. *Estimated based on actual driving times. The total transfer time may be longer when taking rest stops, road construction, and other unanticipated delays into account. Overlooking rice paddy fields and farmhouses, Drubchhu was constructed on the ruins of a former, 100-year-old granary. Today, the family-owned property boasts modest and comfortable accommodations, a fine restaurant, roadside café, and cozy bar plus its own natural spring, believed to be a Drubchhu (healing, miraculous water). Modern amenities such as goose down bedding and walk-in showers add comfort to your journey. Following breakfast and a drive through the Punakha Valley, we begin our walk by first ascending a series of switchbacks to the Khamsung Yuley Namgyel Temple. From this modern temple, we are afforded grand views of the Mo Chu River Valley below. We then descend from the temple and follow a well-worn path down the valley through rice fields and small villages. Along the way we are rewarded with stunning views of the terraced rice paddies providing an exotic backdrop to the river below. After enjoying a picnic lunch alongside the river, we continue our walk to the Punakha Dzong. Constructed in 1637, the Punakha Dzong was the second of Bhutan's dzongs and for many years it served as the seat of the government. Today it is the home to Bhutan's spiritual leader, the Chief Abbot Je Khempo, who resides here with 1,000 monks during the winter months due to Punakha's relatively low altitude by Himalayan standards (4,000'). From this spectacular dzong we can look back to see the Khamsung Yuley Namgyel Temple perched on the hillside far in the distance. A short walk from the dzong takes us back to the road where we meet our driver. Following our hike, we have the special opportunity to visit the Nalanda Buddhist Institute, just outside of Punakha. There we meet the resident monks and learn about their lives (please note that this may also take place in the morning, depending on the monastery's schedule for the day). After breakfast we depart Punakha, up a winding mountain road through oak and rhododendron forest, and over a high pass down into the Phobjikha Valley, surely one of the loveliest high altitude valleys in Bhutan (approximately 9,840'). Phobjikha is one of Bhutan's few glacial valleys, and is the chosen winter home of black-necked cranes, migrating from the Tibetan plateau. If you are looking for a picturesque hike through some of the most beautiful parts of Phobjikha, this is the one. We begin our hike to Longtey village at the Gangtey Gompa, passing through Kumbu village and then ascending steadily from the valley floor. Upon reaching our first pass, we stop for some impressive views of Gangtey Gompa and the Phobjikha Valley below. In the evenings, we sample local specialties such as buckwheat noodles and pancakes, locally produced Swiss-style cheese, fresh apple juice, and a delicious homemade wheat beer. *Estimated based on actual driving times. The total transfer time may be longer when taking rest stops, road construction and other unanticipated delays into account. **The hike on this day may be altered depending on possible driving delays due to road construction/closures. Nestled in the thick pine forests of Phobjikha—home to rare, black-necked cranes—the Dewachen offers a relaxed setting, in-house restaurant, and breathtaking views of the valley below. Sixteen comfortable, double rooms each contain ensuite bathrooms, colorful bedding, and balconies. Rooms are heated by iron stoves, with hot water bags for the bed on the valley’s coldest nights. We stretch our legs on the Gangtey Nature Trail before we continue our drive east to the Bumthang Valley. The Gangtey Nature Trail starts from the mani stone wall (sacred stone walls with Buddhist prayers etched into them) to the north of the Gangtey Gompa and ends in Khewa Lhakhang. We meander through pine and bamboo forests, and gain excellent views of the remote Phobjkha Valley, where we may catch a glimpse of Black Neck Cranes (during the winter months). If time allows, we may also visit the Gangtey Gompa, the only Nyingmapa monastery in western Bhutan. 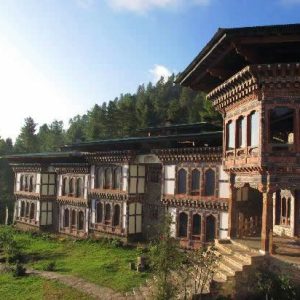 With views of the pine wood forest and historic Wangduechoeling palace, Bhutan Mountain Resort is one of the oldest hotels in Bumthang. The family-owned property offers simple, comfortable accommodations and warm service. 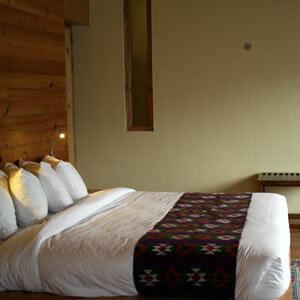 All 27 rooms are appointed with wood paneling, heated by firewood stoves (or Bukhari), with ensuite baths. Featuring an attentive professional staff and in-house restaurant, the lodge is within walking distance of the Wangduechoeling palace, Jakar Dzong and Chamkhar Town. Today's hike begins with a gradual climb through blue pine forest, where along the way, we visit a Pasaling Lhakhang (sacred temple) which overlooks the beautiful valley of Bumthang. Along the route, we are granted breathtaking views of the valley and various species of flora and fauna. Following a picnic lunch, we embark on a hike from Kurje Temple. The trail leads over a suspension bridge and towards Choekhortoe village and the Tamshing area, where we visit the Dorjibi weaving center. We enjoy passing through the pastoral landscape consisting of farmer's fields and farmhouses, and will see villagers as they go about their daily routines. Eventually, we reach Tamshing Lhakhang from where one can get a perfect view of Kurje Temple on the opposite hill where we began. Today we explore further in Bumthang district with an excursion to the stunningly beautiful Tang Valley. This seldom-visited valley offers a treat in revealing some off the beaten track monasteries and the amazing museum at Ugyen Choeling Palace. A fairly short hike takes us up to this well maintained palace and its cultural treasures inside. Along the way we stop for a traditional farmhouse lunch (please note that this may take place on a different day depending on the schedules and availability of local families). We then make a visit Tang Mebartsho (Burning lake), where a famous reincarnated lama, Terton Pema Lingpa, is supposed to have discovered a religious treasure in the 12th century. This lake is very sacred and is visited by many Bhutanese during auspicious days to offer butter lamps. The importance of the site is indicated by the extensive array of prayer flags and it is considered one of the most holy places for Buddhist pilgrimage in Bhutan. 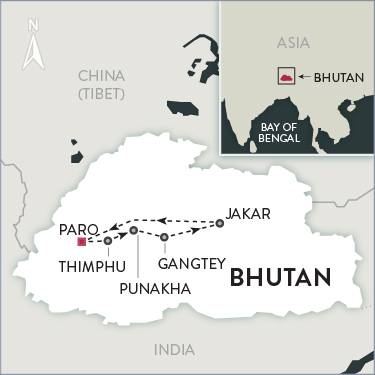 Today we return to western Bhutan by flight (if available) or retrace our route overland to Paro, where our journey began. For those driving, there will be plenty of time to stretch our legs along the way, including stops for both tea breaks and lunch. We have another chance for some spectacular views of the Himalayas as we drive over the Dochu La and Yotung La passes. Following a Bhutanese tradition, we will have the opportunity to spread our own prayer flags at the top of one of these passes, granting us blessings for a long life. For those flying to Paro, you will be met by one of our guides upon your arrival at the airport and will have the day at your leisure. Our group reunites this evening, and we may stretch our legs with a stroll through the market before enjoying dinner together. **Domestic flight: We will book guests on a domestic flight from Jakar to Paro depending upon availability. The sooner you reserve, the more likely you will be confirmed on this flight. If there is no more availability, then you will return to Paro by road. This means the group may split up for the day and reunite in the evening in Paro. For those booked on the domestic flight, please note that there is the possibility for delays or cancellations due to weather. In this case, you will also need to return by road. 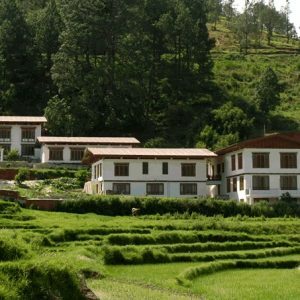 Raven’s Nest Resort is situated in the upper Paro Valley, set amidst farmhouses and rice fields, and very near to the trailhead for Tiger’s Nest Monastery and the ruins of Drukgyel Dzong. Featuring 21 spacious rooms with ensuite baths and balconies, the hotel also has a library, meditation room, spa with a sauna, steam bath and massage services, and a restaurant serving Bhutanese, Indian and western style dishes. Your stay here is the perfect place to unwind and will be a welcome respite in a tranquil, rural setting. 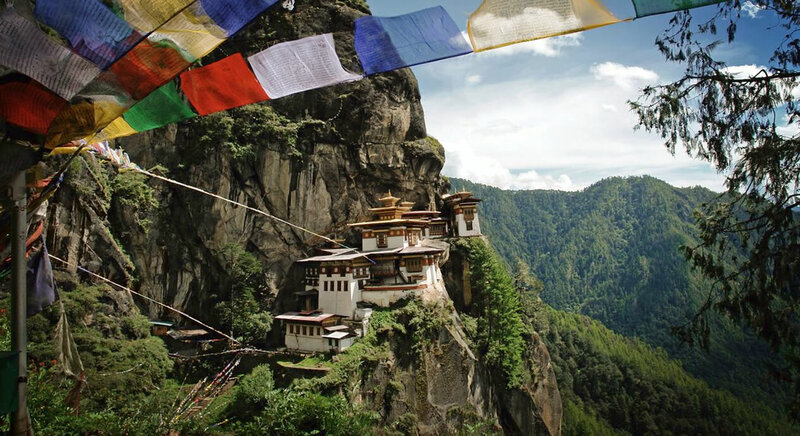 This morning we enjoy a hike to the famous cliffside hermitage called Taktsang or 'Tiger's Nest', a monastic retreat built into a sheer cliff face high above the Paro Valley. Our hike begins on the valley floor and is a steady uphill climb on a wide hiking trail that switchbacks through pine forests, with glimpses of Tiger's Nest along the way. We pass water-powered prayer wheels and mani stones, as well as a shrine where a high lama was supposedly born'all reminders that this is not just a hike, but a spiritual pilgrimage for many. As we near the monastery, we stop by a small teahouse for snacks and tea and take in our first up-close view of Taktsang. From here our hiking trail levels out for a short while, before we begin climbing down steps and cross a bridge, eventually leading us to this most impressive sacred site. As we near the monastery, we stop by a small teahouse for snacks and tea and take in our first up-close view of Taktsang. From here our hiking trail levels out for a short while, before we begin climbing down steps and cross a bridge, eventually leading us to this most impressive sacred site. Legend has it that the Tibetan Buddhist saint, Padmasambhava, flew across the Himalayas on the back of a tiger and landed here, bringing Buddhism to Bhutan. Entry into the monastery feels like stepping back in time and we have the chance to visit several shrines that comprise the temple complex. During our exploration, our guide brings Tiger's Nest to life with the tales of Buddhism that make this one of the most famous pilgrimage sites in all of Bhutan. We return to the valley floor, where we enjoy a trail-side picnic lunch before heading back to our hotel. We have some time this afternoon to unwind and relax after our hike, or you may stroll the Paro market before dinner. Activity Length: 2-3 hours with 1,300’ elevation loss (highest elevation: 12,500’). The day's adventure starts early as we set out on a road that climbs almost 5,000' above the valley floor to Cheli La (12,500'). Towards the end of our scenic hour and a half journey, we emerge from the blue pine and rhododendron forest into windswept highlands favored by yaks. Here, we'll enjoy a view of Himalayan wildflowers, with fields of azaleas, edelweiss, and even the famous blue poppy at certain times of the year. If the weather is clear, we'll enjoy tantalizing glimpses of some of Bhutan's highest peaks. Upon reaching the pass, western Bhutan appears before us, with its unspoiled Haa valley, the mountains of Sikkim to the west, Mt. Chomolhari and Tibet to the north, and the patchwork fields of the Paro Valley to the east. Leaving the prayer flag-swathed col and our vehicle behind, we strike off along the ridge, passing through meadows, before reentering forests of larch, spruce, hemlock, fir, and rhododendron. After a little under two hours, we see the Kila Gompa, seemingly suspended in rock crags. Home to approximately 30 nuns, this place has served as a retreat for meditation since the 9th century. Kila means 'spiritual dagger,' and a visit to the temple is often thought to tame the negative emotions of anger, ignorance, and greed. Following our visit and picnic lunch, we descend on a dirt road that winds through conifers and rhododendrons, catching occasional glimpses back to Cheli La. After about 45 minutes, we arrive at our private vehicle to return to Paro. Along the way, if time allows, we'll break our journey with a short walking detour to Dzongdrakha Gompa and its fine stupa (a dome-shaped Buddhist monument). This rocky aerie is the site of the annual local Paro dromoche (masked dances), the precursor to the grander Paro Tsechu, or festival. Here, we may also have the opportunity to see some local residents: Grey Langur monkeys. This evening, we celebrate our journey through this magical kingdom, and the kind welcome we have received from the generous people of Bhutan. We are transferred to the airport for an early morning departure from Paro. From here we say farewell before our journey home, or continue on to other exciting destinations. Take over a date for your group! See "Make It Private" on Dates & Prices tab. 2019 Festival Dates: April 11-22 and November 8-19 departures coincide with festivals. Our festival departure dates are based on the festival calendar when trips were scheduled. Festival dates may be subject to change, as the local authorities have the right to change the festival dates at any time. If this is the case we will do our best to adjust the itinerary so that we can attend the festival. Call 1-800-941-8010 for details and sample itineraries. While we have done our best to schedule our itineraries to coincide with the domestic flight schedules between Jakar and Paro on Day 9 of this journey, availability is limited and flight schedules are subject to change. Boundless Journeys’ trips are designed for energetic and flexible individuals who like to be active and have a spirit of adventure and a positive attitude. Bhutan: Hiking in the Peaceful Kingdom is rated 2+, easy to moderate, on a scale of 1-5 (with 5 being the most strenuous). The walks and hikes on this trip are easy to moderate day hikes. Hikes generally are from 2-5 hours in length with minimal vehicle support. A few days involve some long drives on narrow, winding roads. Paro, Bhutan International Airport upon arrival of your flight on Day 1. Paro, Bhutan International Airport in time for your departing flight on Day 12. Your Boundless Journeys guide will meet you at the Paro, Bhutan airport upon the arrival of your flight from Bangkok (other regional airports upon request). Paro, Bhutan in time for the departure of your flight to Bangkok (other regional airports upon request). The mountainous areas of Bhutan have pronounced rainy and dry seasons. The driest weather and clearest skies are typically in October and November and it is the harvest season. During March through May, beautiful flowers are in bloom and it is the planting and ploughing time of year. The months of December through February are clear and cool (can be below freezing at night) and it is the shoulder season, so you will encounter fewer visitors. June through August is the monsoon season and it is generally not recommended to travel to Bhutan at this time of year. You may obtain more detailed weather information at www.weatherbase.com. Bhutan is generally delightful for hiking in the spring and fall. The driest weather and clearest skies are typically in late September, October and November. In the months of March, April and May, beautiful flowers are in bloom, and you will encounter fewer travelers. Our trip begins in Thimpu, which is situated at 7,500 feet, in the foothills of the Himalayas. After our first two nights, we move to the Punakha Valley, which offers a relatively low elevation of approximately 4,300’. Our third hotel, in the Phobjikha valley is located at about 9,500’, fourth hotel in the Bumthang Valley, is located at about 8,500’, and our fifth hotel in Paro is at approximately 7,300’. Our walks and hikes will take place at elevations from 4,300’ to a little over 12,000’. Our drive to Cheli La pass will take us to our highest elevation at 12,467’. There is time to move at a comfortable pace, allowing ourselves to adjust to the mountain air. Keeping well hydrated, avoiding excessive alcohol, eating frequent, light meals, and getting plenty of rest will help with any effects of altitude that you may feel. 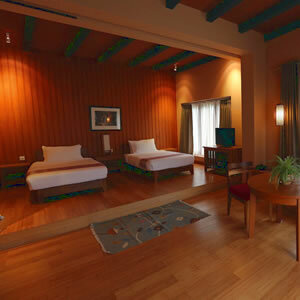 This itinerary includes a combination of the standard and deluxe hotel options available in Bhutan. Although the hotels in Bhutan cannot be compared to international standards, they are comfortable and offer all necessary facilities. 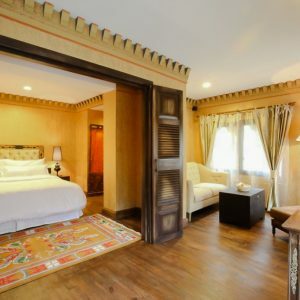 We believe that any inconveniences due to these modest accommodations are far outweighed by the unforgettable experience of visiting Bhutan (If you prefer to stay in luxury hotels in Bhutan, please contact us to discuss a private journey). Due to the unique tourism policy in Bhutan, we are unable to confirm which hotels we will be using until four weeks prior to departure. The accommodations listed will most likely be what we can expect, but may alter due to availability. It is important to reserve your trip early, as the Bhutanese national airline will only accept reservations with the full payment of the ticket. Therefore we are unable to hold group seats in advance of reservations. Seats can only be confirmed upon receipt of your deposit, as well as the payment of $850 for these flights (subject to change). Please contact our office with any questions regarding these important policies. 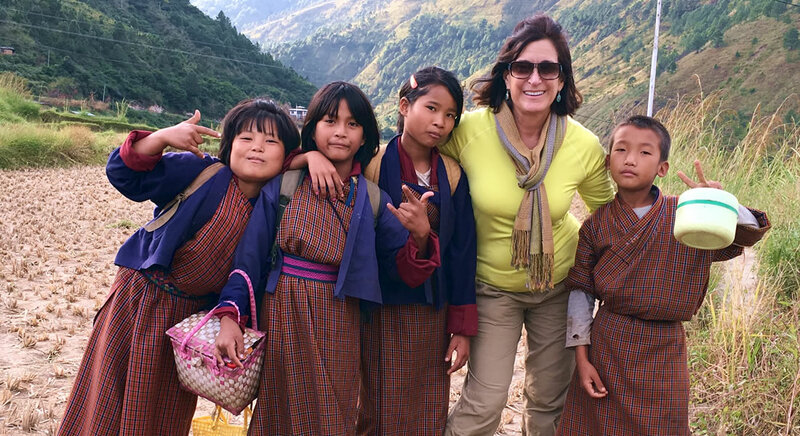 Although visiting Bhutan in many ways is like stepping back in time and has been a longtime favorite of Boundless Journeys’ travelers for this reason, it is important to understand that this evolving society is also eager to keep pace in the modern world. While the government is approaching the development of their country with sensitivity towards preserving the environment and culture, you can still expect to encounter some of the less positive signs of modernization. Some examples include: road construction projects that may hinder driving or cause noise and dust; litter in developed areas; and begging. We ask you to visit Bhutan with an open mind and leave any rigid expectations about the pristine nature of the country behind. It is important to embrace what you see and experience without judgment and recognize that Bhutan, just as any country, is struggling to be a part of this complex and rapidly changing world. We are confident that with this attitude, the Bhutan you experience will be a fascinating and memorable place. hutanese dishes borrow elements of Indian and Chinese cuisine, however it is also unique in its style and tastes. One of the most distinguishing features of Bhutanese cuisine is the ubiquitous chili. The Bhutanese are passionate about chili; you will see them spread all over to dry - on the roadsides, on rooftops and in courtyards. Ema datse, a dish made with chilis and cheese, is a spicy favorite. Some excellent non-spicy options include kewa datse (potatoes and cheese sauce), and shamu datse (mushrooms with cheese sauce). Bhutanese also love momos. Though a Tibetan specialty, these dumplings now occupy a permanent place in Bhutanese cuisine. Chicken or pork momos are favored, but cheese momos are most common. Another important feature of this exotic cuisine is the use of rice, found in various forms in dishes ranging from breakfast to dinner. We do our best to offer a la carte meals at unique local establishments, however, options are quite limited in the smaller towns, so many of the meals will be served buffet-style at our hotels. There are usually continental, Bhutanese, Chinese, and Indian dishes served. While we do our best to offer our guests the best possible meals and food available in Bhutan, it is important to know that the food there is basic and does not offer the variety and quality that we may be accustomed to at home. Please travel to Bhutan with an open mind and do not have high expectations in this regard and you will not be disappointed. Vegetarians can easily be accommodated with advance notice. Dawa has led a variety of Boundless Journeys tours from treks in the mountains to festival celebrations in the valleys. 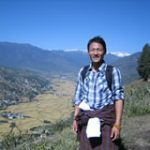 He has experience leading groups at high altitude and as a native of Bhutan, he knows the hidden gems and local characters. Kinley (or Kelly, as he is known among his Bhutanese coworkers) joined our local staff of guides after completing extensive training in 2006. Kinley is extremely knowledgeable about the local area and culture and is always determined to make each trip special by taking guests’ personal interests into consideration to make the trip a richer experience. Kinley has led many tours for Boundless Journeys and is a favorite among our guests for his friendly, down to earth manner. Guests have enjoyed his joyous, enthusiastic nature and commented on his deep love and respect for his country and its people. Mr. Wangchuk, as his fellow Bhutanese call him, was born in Thimphu and is deeply connected with his family—returning to his ancestral village every winter to attend a ritual ceremony. 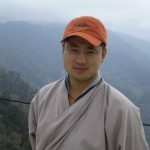 He has been guiding for more than ten years and has explored many of the rural valleys and villages of Bhutan. An avid hiker, excellent archer, and a passion for acting, he has, in fact, played parts in several Bhutanese films. 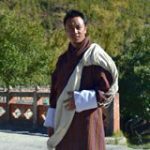 Mr. Wangchuk has a passion for facilitating guests’ exploration of Bhutan, and the combination of his local knowledge and good-natured personality makes him a valued member of our Bhutan guiding team. Easy to moderate walking and hiking, 3-5 hours per day; easy to moderate touring; some long drives on narrow, winding roads.